I recently wrote that statement on a blog discussion. The convective flow of heat to the top of the atmosphere needs energy because the convection cycle does work. That is because convection and the maintenance of the lapse rate is a heat engine. I have tried to analyse this statement quantitatively through two thought experiment – one for radiation and one for convection. Firstly lets look at radiation. Case 1 as shown in Figure 1. In this scenario there is 100% Radiative transfer of heat to space through an absorbant atmosphere and no convection. Here we imaging an Earth like surface but with a vacuum gap immediately above it. Above this vacuum gap follows a 100% IR absorbant layer acting like a black body, and above that empty space. Convection from the surface is impossible so it can only cool by radiation. Energy balance ensures that the top layer reaches 255K and acts like a black body radiating equally upwards and downwards. 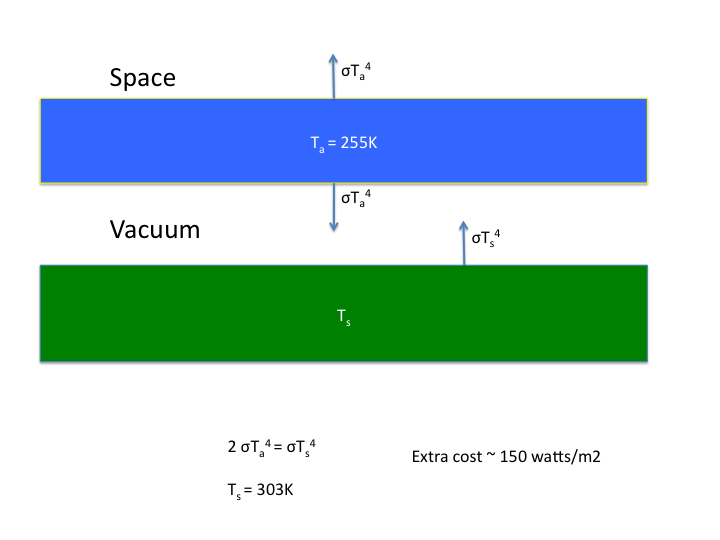 It then follows that the ground surface temperature must be 303 C in order to radiate the 480 watts/m2 – a total extra energy cost of 240 watts/m2. The actual extra radiation on Earth today is 150 watts/m2. Case 2 as shown in Figure 2. This scenario is of an Earth like surface which can only lose heat through convection. This thought experiments takes an exactly opposite situation to Case 1. Now the planet surface is assumed to have zero emissivity (it is covered with a completely reflective IR foil transparent to solar radiation) so no radiation can escape to space. The atmosphere is the same as that on Earth, and all energy is transported to the top of the atmosphere by convection where it then radiates away to space. The atmosphere follows the dry adiabatic lapse rate. To simplify the maths we are going to make some simple and (unphysical) assumptions. Air is warmed at the surface rises immediately (isothermally) to the TOA where it cools. It then descends immediately (isothermally) to the surface where it again warms to cycle again. 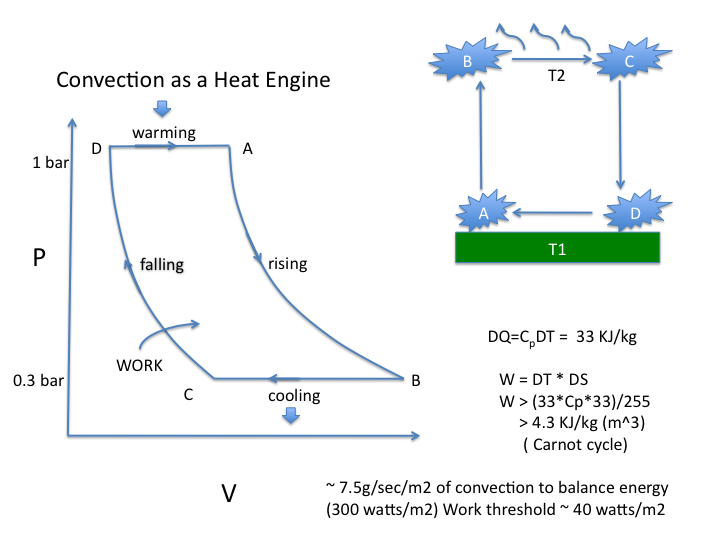 Figure 2: Convection as a Heat engine. These assumptions allow us to make a minimum estimate of the work done by the convective heat engine based on the carnot cycle. To balance the incident solar energy maintaining a surface temperature of 288K and a TOA temperature of 255K needs 7.5g/sec m^2 to be convected expending a minimum of 40 watts/m2. In reality of course the air rises adiabatically cooling as it rises so this is just a ball park figure. A planet with no atmosphere can only radiate IR from its surface to balance energy. Imagine it slowly gaining an atmosphere which absorbs IR. Little changes until the absorption length becomes about the same as the distance to the top of the atmosphere. Convection starts once a small amount of energy is absorbed by the atmosphere thereby setting up an initial lapse rate. This now allows heat to pass directly to the free radiation zone higher up, and it also enables radiative transfer of heat through the atmosphere to begin. Eventually the balance between radiative transfer of heat and convective transfer of heat will depend on the optical depth of the atmosphere. This also determines the height of the troposphere. On Venus for example convection dominates heat transfer from the surface and the tropopause is over 60 km above the surface. Now consider a volcanic vent deep underneath the Atlantic Ocean. The lava oozing out of it is say at 1000C and radiating as a black body. All that radiation is absorbed within 100m by the surrounding water and cannot escape (to space) to cool the vent. Instead the surrounding water gets super-heated and then rises by convection to be replaced by colder water. All the heat is carried away by convection currents and essentially none of it by radiation. Eventually the excess heat reaches the surface and is exchanged with the atmosphere. Convection wins hands down in this case. Exactly the same process happens in the atmosphere as it is heated from below by the surface. Even though some of the IR can escape directly to space most of the heat is instead transported away by convection and especially for the 70% of the surface covered by oceans by evaporation. It is convection that sets up and maintains the lapse rate. Latent heat release reduces the dry adiabatic lapse rate up to cloud tops. The lapse rate itself makes it thermodynamically possible for radiative transfer of heat. Without it there would be no greenhouse effect. The subtle point though is that it is only because the IR refractive index of the atmosphere is less than 1, that convection can start and be maintained at all. I think everything is linked together through one “atmosphere effect” which includes convection, latent heat and radiative transfer. So to discuss the “greenhouse effect” in isolation from convection and evaporation is wrong and so is discussing thermodynamic effects without including radiation. This entry was posted in AGW, Climate Change, climate science, Physics, Science and tagged Convection, global warming, greenhouse. Bookmark the permalink. I would say “Convection can only begin once it becomes energy efficient.” Period. Basically, if the actual lapse rate is below the adiabatic lapse rate, the atmosphere is stable. If the actual lapse rate is above the adiabatic lapse rate, the atmosphere is unstable and will start to convect. This is in addition to any effects of conduction or radiation. I could *speculate* that there would still be a lapse rate and that the surface would be even warmer by ~ 10 K/km of atmosphere, but that is just speculation at this point. Finally, I would ask “does work ON WHAT?” Doing work on something means something is gaining KE or PE. Winds are not increasing hour after hour. The atmosphere is not getting lifted high hour after hour. Any work done is simply “dissipated” by friction/turbulence back to the atmosphere, with no net work being done on anything in equilibrium. The atmosphere is the ultimate inefficient heat engine! Any work it does is converted back to thermal energy before “leaving the heat engine”! I have very different thoughts on this, but I will save them until hearing your response so far. Ah! Now you have completely changed the situation! Yes you are right I have eliminated about 1/3 of the heat loss from the surface by IR. I am forcing the surface to cool only by convection. However the atmosphere itself can still radiate to space as before, it is just that now only convection (and latent heat) are available to cool the surface. If greenhouse gases remain the same then 240 watts still have to leave the atmosphere and the temperature should remain 255K at the same height. The lapse rate stays the same so I think the temperature would as well. The difference to Venus is that the atmosphere is 90 times more massive and contains gases blocking most of the IR spectrum as well as 95% CO2. The effective radiation height is 40 km up rather than 5 km up. The work is done on the atmosphere generating weather, so yes it ends up as heat. This inefficient heat engine does however move heat up through the atmosphere until it can radiate directly to space. It doesn’t need any radiative transfer to move the heat. If there was no lapse rate there could be no net radiative transfer upwards. Yes I agree with you that convection on Earth today acts to restore the lapse rate when surface heating increases the temperature gradient. But how did the lapse rate get started in the first place? Was it through convection or radiation ? If the atmosphere were isothermal the greenhouse effect could not work since the outgoing radiative flux is the same at all heights. What I was really trying to say is that on Earth today about 15% of heat is convected, 30% is radiated and 52% evaporated. The work done by convection and the latent heat is dumped directly to the atmosphere driving weather. 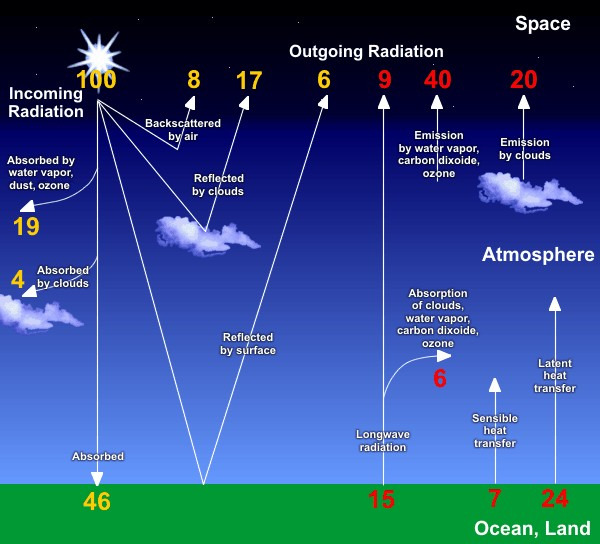 About 40% of the surface radiation gets absorbed by the atmosphere and the rest passes through to space. Clouds, water vapour and CO2 radiate atmospheric heat to space from the top of the troposphere. The atmosphere receives 5 times more heat energy from convection and evaporation latent heat than it does from radiation. It is therefore more energy efficient for the surface to cool through convection and latent heat rather than through radiation. The two examples above show that it costs nearly 3 times more energy to radiate through an absorbent atmosphere than it does to convect through it. If we end up doubling CO2 on Earth thereby inducing a 3.5 watts/m2 radiative forcing any increase in surface temperature will result in another 2.8 watts/m2 increase in convection and evaporation, and less than ~ 1 watt increase in net IR radiation. The effective height for for 15 micron photons to radiate freely to space will increase slightly, but I suspect this is more than offset by increased clouds and heat flowing directly to this level. P.S. I think the debate on your post at Tallbloke got too polarised. Physics will be the final judge – not belief or politics. In that sense if I am wrong then I am happy to admit it. I will answer some detailed points below. In your opening paragraph, why 255 K for the top of the atmosphere? What is the “extra cost”? Extra compared to what? Is the extra cost 150 W/m2 or 240 W/m2? So far as I know, “Isothermal” means “at the same temperature”. The gas rising to the top of the atmosphere is expanding and cooling. I think you must mean “adiabatic”, which means “no heat passes in or out of the gas”. Are you sure you mean “IR refractive index”? The “IR refractive index” of the atmosphere is 1.00027 at sea-level. Apart from these ambiguities, I think I agree with your conclusion. But to put this to the test, how about Case 3: what would happen if your planet surface were opaque to infra-red, and your atmosphere were transparent? In your consideration, please ignore all effects due to rotation of the planet. I agree it is confusing. I wrote it too fast and should have thought things through better. By extra cost I mean the additional energy emitted by the surface, compared to no atmosphere at all. 255K just equals the temperature needed to balance the absorbed energy of the sun currently on Earth. Actually the calculation of work done by convection was based on your post http://homeclimateanalysis.blogspot.co.uk/2010/04/work-by-convection.html Of course the gas does rise adiabatically, but I just wanted to get a lower estimate of the work done based on a Carnot cycle. The Carnot cycle needs isothermal and adiabatic expansion/ compression. Perhaps you have a better estimate for work done ? Convection really only happens when the temperature gradient becomes greater than the adiabatic lapse rate. It acts to rebalance heat in the atmosphere. Case 3: I will have to think more about ! To calculate work by convection, you can try the following procedure, based upon enthalpy, based upon my post Convection. At state C, pick a temperature for the start of the rise. Assume adiabatic expansion for diatomic gas to state D. Adiabatic expansion does not change the enthalpy of the gas. As it cools, its internal heat energy is replaced by its volume energy. (I’m sure you know this already, but maybe some other readers want more clarity.) You have a ratio of pressures and a starting temperature so you can use p^0.4*T^-1.4 = constant to obtain the temperature at D.
Now you allow some cooling at the tropopause (TOA) to get to state A. You can pick the cooling, say 10 K. Assume constant pressure. With specific heat capacity at constant pressure of 1 kJ/kg/K for air you get -10 kJ/kg change in the enthalpy of the gas. Not only does it lose internal heat, but it loses some of its volume energy too. Now allow adiabatic compression to state B. Once again, you know starting temperature and ratio of pressures, and you can assume constant enthalpy. You calculate the temperature at B. To complete the cycle, the air in state B must warm at constant pressure to state C, where you assumed the first temperature. This warming will be greater than 10 K (the adiabatic expansion equation guarantees that this will be the case). The warming should be around 20 K if you have the ratio of pressures at 0.5. The enthalpy of the gas increases by 20 kJ/kg as it warms. “If greenhouse gases remain the same then 240 watts still have to leave the atmosphere and the temperature should remain 255K at the same height. If 240 watts still leave the atmosphere, then the GHGs will have to warm up significantly (about 5% warmer)! As you say, the lapse rate will remain about the same, so the surface will ALSO warm up significantly (also about 5% warmer, or ~ 12-15 K (ignoring all sorts of OTHER changes that might also be occurring)). It is not either/or, it is both/and. With thermal radiation taking energy out of the top (and sunlight adding it to the bottom), the top will start to cool and the bottom with start to warm. This will start some flow of heat. Conduction thu gases is very ineffective, unable to move more than a few mW/m^2. Once the thermal gradient tries to go above the lapse rate, convection kicks in, basically acting as a “governor” in the temperature. So for all practical purposes, the actual lapse rate will ALWAYS be approximately the adiabatic lapse rate in any planetary atmosphere. At what temperature does radiation cease being effective and therefore convection becomes more effective? This is specifically in hot gases.